Why do those who lose weight eventually gain it back? Rosenbaum and colleagues use functional magnetic resonance imaging to examine the effects of weight loss and leptin on neural activity (page 2583). They found alterations in neural activity in response to visual food cues in regions of the brain known to control regulatory and hedonic aspects of energy intake. These changes in neural activity during maintenance of a reduced weight were due substantially to central leptin deficiency. Image credit: Photo Researchers Inc. (brain section) and Karen Guth (grapes). Citation Information: J Clin Invest. 2008;118(6):1975-1975. https://doi.org/10.1172/JCI36020. Citation Information: J Clin Invest. 2008;118(6):1976-1976. https://doi.org/10.1172/JCI36079. Citation Information: J Clin Invest. 2008;118(6):1977-1977. https://doi.org/10.1172/JCI36048. Citation Information: J Clin Invest. 2008;118(6):1978-1978. https://doi.org/10.1172/JCI36051. Citation Information: J Clin Invest. 2008;118(6):1979-1990. https://doi.org/10.1172/JCI34359. Disturbances in mechanisms that direct abnormal cells to undergo apoptosis frequently and critically contribute to tumorigenesis, yielding a logical target for potential therapeutic intervention. There is currently heightened interest in the extrinsic apoptosis pathway, with several proapoptotic receptor agonists (PARAs) in development. The PARAs include the ligand recombinant human Apo2L/TRAIL and agonistic mAbs. Mechanistic and preclinical data with Apo2L/TRAIL indicate exciting opportunities for synergy with conventional therapies and for combining PARAs with other molecularly targeted agents. Novel molecular biomarkers may help identify those patients most likely to benefit from PARA therapy. The anticancer immune response: indispensable for therapeutic success? Citation Information: J Clin Invest. 2008;118(6):1991-2001. https://doi.org/10.1172/JCI35180. Although the impact of tumor immunology on the clinical management of most cancers is still negligible, there is increasing evidence that anticancer immune responses may contribute to the control of cancer after conventional chemotherapy. Thus, radiotherapy and some chemotherapeutic agents, in particular anthracyclines, can induce specific immune responses that result either in immunogenic cancer cell death or in immunostimulatory side effects. This anticancer immune response then helps to eliminate residual cancer cells (those that fail to be killed by chemotherapy) or maintains micrometastases in a stage of dormancy. Based on these premises, in this Review we address the question, How may it be possible to ameliorate conventional therapies by stimulating the anticancer immune response? Moreover, we discuss the rationale of clinical trials to evaluate and eventually increase the contribution of antitumor immune responses to the therapeutic management of neoplasia. Citation Information: J Clin Invest. 2008;118(6):2002-2011. https://doi.org/10.1172/JCI35433. Phagocytosis is a key component of the innate immune response and of the clearance of apoptotic bodies. Phagosome formation and subsequent maturation require extensive cytoskeletal rearrangement and precisely choreographed vesicular fusion and fission events. The objectives of this review are to highlight the functional importance of lipids in the phagocytic process, to discuss how pathogenic microorganisms can in some cases manipulate host lipid metabolism to either co-opt or disrupt phagosome maturation and promote their own survival, and to describe how defective phagosomal lipid metabolism can result in disease. Overindulgence and metabolic syndrome: is FoxO1 a missing link? Citation Information: J Clin Invest. 2008;118(6):2012-2015. https://doi.org/10.1172/JCI35693. Excessive production of triglyceride-rich VLDL, which can result from dietary overindulgence, underlies metabolic syndrome — a combination of disorders including high blood pressure, obesity, high triglyceride, and insulin resistance — and places individuals at increased risk of developing cardiovascular disease and type 2 diabetes. However, the link between VLDL overproduction and insulin resistance has remained unclear. VLDL assembly in the liver is catalyzed by microsomal triglyceride transfer protein (MTP). In this issue of the JCI, Kamagate et al. investigate the events controlling hepatic MTP expression and VLDL production and secretion (see the related article beginning on page 2347). They demonstrate that MTP is a target of the transcription factor FoxO1 and that excessive VLDL production associated with insulin resistance is caused by the inability of insulin to regulate FoxO1 transcriptional activation of MTP. Regulation of Aβ pathology by beclin 1: a protective role for autophagy? Citation Information: J Clin Invest. 2008;118(6):2015-2018. https://doi.org/10.1172/JCI35662. The amyloid β (Aβ) peptide is thought to be a major culprit in Alzheimer disease (AD), and its production and degradation have been intensely investigated. Nevertheless, it remains largely unknown how Aβ pathology is modulated by the autophagy pathway. The study by Pickford and colleagues in this issue of the JCI shows that beclin 1, a multifunctional protein that also plays an important role in the autophagy pathway, affects some aspects of Aβ pathology in aged but not young transgenic mice expressing amyloid precursor protein (APP) (see the related article beginning on page 2190). These findings further support the notion that modulation of autophagy, in this case through beclin 1, may represent a novel therapeutic strategy for AD. Citation Information: J Clin Invest. 2008;118(6):2018-2021. https://doi.org/10.1172/JCI35931. The serine/threonine protein kinase AKT (also known as PKB) signaling pathway has been associated with several human diseases, including schizophrenia. Studies in preclinical models have demonstrated that impaired AKT signaling affects neuronal connectivity and neuromodulation and have identified AKT as a key signaling intermediary downstream of dopamine (DA) receptor 2 (DRD2), the best-established target of antipsychotic drugs. A study by Tan et al. in this issue of the JCI strengthens links among AKT signaling, DA transmission, and cognition in healthy individuals and offers potential avenues to explore in an effort to find more effective pharmacotherapies for schizophrenia and related disorders (see the related article beginning on page 2200). Is CD133 a marker of metastatic colon cancer stem cells? Citation Information: J Clin Invest. 2008;118(6):2021-2024. https://doi.org/10.1172/JCI36046. The concept of the so-called cancer stem cell (CSC) holds that only a minority of cells within a tumor have the ability to generate a new tumor. Over the last decade, a large body of literature has implicated the protein CD133 as a marker of organ-specific adult stem cells and in some cancers as a bona fide CSC marker. In this issue of the JCI, Shmelkov et al. challenge the view that CD133 is a marker of CSCs in colon cancer (see the related article beginning on page 2111). CD133 was thought previously to have a very restricted distribution within tissues; the authors have used genetic knock-in models to demonstrate that CD133 in fact is expressed on a wide range of differentiated epithelial cells in adult mouse tissues and on spontaneous primary colon tumors in mice. In primary human colon tumors, all of the epithelial cells also expressed CD133, whereas metastatic colon cancers isolated from liver had distinct CD133+ and CD133– epithelial populations. Intriguingly, the authors demonstrate that the CD133+ and CD133– populations were equally capable of tumor initiation in xenografts. In light of these new findings, the popular notion that CD133 is a marker of colon CSCs may need to be revised. Citation Information: J Clin Invest. 2008;118(6):2025-2038. https://doi.org/10.1172/JCI34267. Neuroprotection can be achieved by preventing apoptotic death of postmitotic cells. Apoptotic death can occur by either a caspase-dependent mechanism, involving cytochrome c, apoptosis protease-activating factor–1 (Apaf-1), and caspase-9, or a caspase-independent mechanism, involving apoptosis-inducing factor (AIF). HIV protease inhibitors (PIs) avert apoptosis in part by preventing mitochondrial outer membrane permeabilization (MOMP), but the precise mechanism by which they work is not known. Here, we evaluated the impact of the PIs in a mouse model of retinal detachment (RD) in vivo and in murine primary retinal cell cultures in vitro. Oral administration of the PIs nelfinavir and ritonavir significantly inhibited photoreceptor apoptosis, while preventing the translocation of AIF from mitochondria to the nucleus as well as the activation of caspase-9. RD-induced photoreceptor apoptosis was similarly inhibited in mice carrying hypomorphic mutations of the genes encoding AIF or Apaf-1. Nelfinavir attenuated apoptosis as well as mitochondrial release of AIF and cytochrome c, and subsequent activation of caspase-9 in vitro, in photoreceptor cultures exposed to starvation or monocyte chemoattractant protein–1–stimulated (MCP-1–stimulated) macrophages. Our results suggest that the MOMP inhibition by PIs involved interruption of both caspase-dependent and caspase-independent apoptosis pathways and that PIs may be clinically useful for the treatment of diseases caused by excessive apoptosis. Citation Information: J Clin Invest. 2008;118(6):2039-2049. https://doi.org/10.1172/JCI33814. Naturally SIV-infected sooty mangabeys (SMs) remain asymptomatic despite high virus replication. Elucidating the mechanisms underlying AIDS resistance of SIV-infected SMs may provide crucial information to better understand AIDS pathogenesis. In this study, we assessed the determinants of set-point viremia in naturally SIV-infected SMs, i.e., immune control of SIV replication versus target cell limitation. We depleted CD4+ T cells in 6 naturally SIV-infected SMs by treating with humanized anti-CD4 mAb (Cdr-OKT4A-huIgG1). CD4+ T cells were depleted almost completely in blood and BM and at variable levels in mucosal tissues and LNs. No marked depletion of CD14+ monocytes was observed. Importantly, CD4+ T cell depletion was associated with a rapid, significant decline in viral load, which returned to baseline level at day 30–45, coincident with an increased fraction of proliferating and activated CD4+ T cells. Throughout the study, virus replication correlated with the level of proliferating CD4+ T cells. CD4+ T cell depletion did not induce any changes in the fraction of Tregs or the level of SIV-specific CD8+ T cells. Our results suggest that the availability of activated CD4+ T cells, rather than immune control of SIV replication, is the main determinant of set-point viral load during natural SIV infection of SMs. Citation Information: J Clin Invest. 2008;118(6):2050-2061. https://doi.org/10.1172/JCI31244. Cyclin-dependent kinase inhibitors, including p21Cip1, are implicated in cell turnover and are active players in cardiovascular wound repair. Here, we show that p21Cip1 orchestrates the complex interactions between local vascular and circulating immune cells during vascular wound repair. In response to femoral artery mechanical injury, mice with homozygous deletion of p21Cip1 displayed accelerated proliferation of VSMCs and increased immune cell infiltration. BM transplantation experiments indicated that local p21Cip1 plays a pivotal role in restraining excessive proliferation during vascular wound repair. Increased local vascular stromal cell–derived factor-1 (SDF-1) levels were observed after femoral artery injury in p21+/+ and p21–/– mice, although this was significantly greater in p21–/– animals. In addition, disruption of SDF-1/CXCR4 signaling inhibited the proliferative response during vascular remodeling in both p21+/+ and p21–/– mice. We provide evidence that the JAK/STAT signaling pathway is an important regulator of vascular SDF-1 levels and that p21Cip1 inhibits STAT3 binding to the STAT-binding site within the murine SDF-1 promoter. Collectively, these results suggest that p21Cip1 activity is essential for the regulation of cell proliferation and inflammation after arterial injury in local vascular cells and that the SDF-1/CXCR4 signaling system is a key mediator of vascular proliferation in response to injury. Citation Information: J Clin Invest. 2008;118(6):2062-2075. https://doi.org/10.1172/JCI32832. Experimental and clinical evidence indicate that bone marrow cells participate in the process of new blood vessel formation. However, the molecular mechanisms underlying their recruitment and their exact role are still elusive. Here, we show that bone marrow cells are recruited to the sites of neoangiogenesis through the neuropilin-1 (NP-1) receptor and that they are essential for the maturation of the activated endothelium and the formation of arteries in mice. By exploiting adeno-associated virus vector–mediated, long-term in vivo gene expression, we show that the 165-aa isoform of VEGF, which both activates the endothelium and recruits NP-1+ myeloid cells, is a powerful arteriogenic agent. In contrast, neither the shortest VEGF121 isoform, which does not bind NP-1 and thus does not recruit bone marrow cells, nor semaphorin 3A, which attracts cells but inhibits endothelial activation, are capable of sustaining arterial formation. Bone marrow myeloid cells are not arteriogenic per se nor are they directly incorporated in the newly formed vasculature, but they contribute to arterial formation through a paracrine effect ensuing in the activation and proliferation of tissue-resident smooth muscle cells. Citation Information: J Clin Invest. 2008;118(6):2076-2087. https://doi.org/10.1172/JCI33715. Transcription factors regulate tissue patterning and cell fate determination during development; however, expression of early regulators frequently abates upon differentiation, suggesting that they may also play a role in maintaining an undifferentiated phenotype. The transcription factor paired box 3 (Pax3) is expressed by multipotent neural crest precursors and is implicated in neural crest disorders in humans such as Waardenburg syndrome. Pax3 is required for development of multiple neural crest lineages and for activation of lineage-specific programs, yet expression is generally extinguished once neural crest cells migrate from the dorsal neural tube and differentiate. Using a murine Cre-inducible system, we asked whether persistent Pax3 expression in neural crest derivatives would affect development or patterning. We found that persistent expression of Pax3 in cranial neural crest cells resulted in cleft palate, ocular defects, malformation of the sphenoid bone, and perinatal lethality. Furthermore, we demonstrated that Pax3 directly regulates expression of Sostdc1, a soluble inhibitor of bone morphogenetic protein (BMP) signaling. Persistent Pax3 expression renders the cranial crest resistant to BMP-induced osteogenesis. Thus, one mechanism by which Pax3 maintains the undifferentiated state of neural crest mesenchyme may be to block responsiveness to differentiation signals from the environment. These studies provide in vivo evidence for the importance of Pax3 downregulation during differentiation of multipotent neural crest precursors and cranial development. Citation Information: J Clin Invest. 2008;118(6):2088-2097. https://doi.org/10.1172/JCI33392. Osteoclasts (OCs) function to reabsorb bone and are responsible for the bone loss associated with inflammatory arthritis and osteoporosis. OC numbers are elevated in most disorders of accelerated bone destruction, reflecting altered rates of precursor differentiation and apoptosis. Both of these processes are regulated by the JNK family of MAP kinases. In this study, we have demonstrated that the NF-κB subunit RelA/p65 inhibits JNK-mediated apoptosis during a critical period of commitment to the OC phenotype in response to the cytokine RANKL. This RelA/p65-mediated arrest of cell death led to enhanced OC differentiation. Hence, Rela–/– OC precursors displayed prolonged JNK activation in response to RANKL, and this was accompanied by an increase in cell death that prevented efficient differentiation. Although complete blockade of JNK activity inhibits osteoclastogenesis, both short-term blockade in RelA-deficient cultures and suppression of the downstream mediator, Bid rescued apoptosis and differentiation. These antiapoptotic effects were RelA specific, as overexpression of RelA, but not RelB, blocked apoptosis and rescued differentiation in Rela–/– precursors. Thus, RelA blocks a RANKL-induced, apoptotic JNK-Bid pathway, thereby promoting OC differentiation. Consistent with this, mice lacking RelA/p65 in the hematopoietic compartment were shown to have a deficient osteoclastogenic response to RANKL and were protected from arthritis-induced osteolysis. Citation Information: J Clin Invest. 2008;118(6):2098-2110. https://doi.org/10.1172/JCI34584. The mouse CD8α+ DC subset excels at cross-presentation of antigen, which can elicit robust CTL responses. A receptor allowing specific antigen targeting to this subset and its equivalent in humans would therefore be useful for the induction of antitumor CTLs. Here, we have characterized a C-type lectin of the NK cell receptor group that we named DC, NK lectin group receptor-1 (DNGR-1). DNGR-1 was found to be expressed in mice at high levels by CD8+ DCs and at low levels by plasmacytoid DCs but not by other hematopoietic cells. Human DNGR-1 was also restricted in expression to a small subset of blood DCs that bear similarities to mouse CD8α+ DCs. The selective expression pattern and observed endocytic activity of DNGR-1 suggested that it could be used for antigen targeting to DCs. Consistent with this notion, antigen epitopes covalently coupled to an antibody specific for mouse DNGR-1 were selectively cross-presented by CD8α+ DCs in vivo and, when given with adjuvants, induced potent CTL responses. When the antigens corresponded to tumor-expressed peptides, treatment with the antibody conjugate and adjuvant could prevent development or mediate eradication of B16 melanoma lung pseudometastases. We conclude that DNGR-1 is a novel, highly specific marker of mouse and human DC subsets that can be exploited for CTL cross-priming and tumor therapy. Citation Information: J Clin Invest. 2008;118(6):2111-2120. https://doi.org/10.1172/JCI34401. Colon cancer stem cells are believed to originate from a rare population of putative CD133+ intestinal stem cells. Recent publications suggest that a small subset of colon cancer cells expresses CD133, and that only these CD133+ cancer cells are capable of tumor initiation. However, the precise contribution of CD133+ tumor-initiating cells in mediating colon cancer metastasis remains unknown. Therefore, to temporally and spatially track the expression of CD133 in adult mice and during tumorigenesis, we generated a knockin lacZ reporter mouse (CD133lacZ/+), in which the expression of lacZ is driven by the endogenous CD133 promoters. Using this model and immunostaining, we discovered that CD133 expression in colon is not restricted to stem cells; on the contrary, CD133 is ubiquitously expressed on differentiated colonic epithelium in both adult mice and humans. Using Il10–/–CD133lacZ mice, in which chronic inflammation in colon leads to adenocarcinomas, we demonstrated that CD133 is expressed on a full gamut of colonic tumor cells, which express epithelial cell adhesion molecule (EpCAM). Similarly, CD133 is widely expressed by human primary colon cancer epithelial cells, whereas the CD133– population is composed mostly of stromal and inflammatory cells. Conversely, CD133 expression does not identify the entire population of epithelial and tumor-initiating cells in human metastatic colon cancer. Indeed, both CD133+ and CD133– metastatic tumor subpopulations formed colonospheres in in vitro cultures and were capable of long-term tumorigenesis in a NOD/SCID serial xenotransplantation model. Moreover, metastatic CD133– cells form more aggressive tumors and express typical phenotypic markers of cancer-initiating cells, including CD44 (CD44+CD24–), whereas the CD133+ fraction is composed of CD44lowCD24+ cells. Collectively, our data suggest that CD133 expression is not restricted to intestinal stem or cancer-initiating cells, and during the metastatic transition, CD133+ tumor cells might give rise to the more aggressive CD133– subset, which is also capable of tumor initiation in NOD/SCID mice. Citation Information: J Clin Invest. 2008;118(6):2121-2131. https://doi.org/10.1172/JCI30473. Cytosolic phospholipase A2α (cPLA2α) hydrolyzes arachidonic acid from cellular membrane phospholipids, thereby providing enzymatic substrates for the synthesis of eicosanoids, such as prostaglandins and leukotrienes. Considerable understanding of cPLA2α function has been derived from investigations of the enzyme and from cPLA2α-null mice, but knowledge of discrete roles for this enzyme in humans is limited. We investigated a patient hypothesized to have an inherited prostanoid biosynthesis deficiency due to his multiple, complicated small intestinal ulcers despite no use of cyclooxygenase inhibitors. Levels of thromboxane B2 and 12-hydroxyeicosatetraenoic acid produced by platelets and leukotriene B4 released from calcium ionophore–activated blood were markedly reduced, indicating defective enzymatic release of the arachidonic acid substrate for the corresponding cyclooxygenase and lipoxygenases. Platelet aggregation and degranulation induced by adenosine diphosphate or collagen were diminished but were normal in response to arachidonic acid. Two heterozygous single base pair mutations and a known SNP were found in the coding regions of the patient’s cPLA2α genes (p.[Ser111Pro]+[Arg485His; Lys651Arg]). The total PLA2 activity in sonicated platelets was diminished, and the urinary metabolites of prostacyclin, prostaglandin E2, prostaglandin D2, and thromboxane A2 were also reduced. These findings characterize what we believe is a novel inherited deficiency of cPLA2. Citation Information: J Clin Invest. 2008;118(6):2132-2147. https://doi.org/10.1172/JCI31073. Insulin resistance is a hallmark of type 2 diabetes, and many insights into the functions of insulin have been gained through the study of mice lacking the IR. To gain a better understanding of the role of insulin action in the brain versus peripheral tissues, we created 2 mouse models with inducible IR inactivation, 1 in all tissues including brain (IRΔwb), and 1 restricted to peripheral tissues (IRΔper). While downregulation of IR expression resulted in severe hyperinsulinemia in both models, hyperglycemia was more pronounced in IRΔwb mice. Both strains displayed a dramatic upregulation of hepatic leptin receptor expression, while only IRΔper mice displayed increased hepatic Stat3 phosphorylation and Il6 expression. Despite a similar reduction in IR expression in white adipose tissue (WAT) mass in both models, IRΔwb mice had a more pronounced reduction in WAT mass and severe hypoleptinemia. Leptin replacement restored hepatic Stat3 phosphorylation and normalized glucose metabolism in these mice, indicating that alterations in glucose metabolism occur largely as a consequence of lipoathrophy upon body-wide IR deletion. Moreover, chronic intracerebroventricular insulin treatment of control mice increased fat mass, fat cell size, and adipose tissue lipoprotein lipase expression, indicating that CNS insulin action promotes lipogenesis. These studies demonstrate that central insulin action plays an important role in regulating WAT mass and glucose metabolism via hepatic Stat3 activation. Citation Information: J Clin Invest. 2008;118(6):2148-2156. https://doi.org/10.1172/JCI33777. Permanent neonatal diabetes mellitus (PNDM) is a rare disorder usually presenting within 6 months of birth. Although several genes have been linked to this disorder, in almost half the cases documented in Italy, the genetic cause remains unknown. Because the Akita mouse bearing a mutation in the Ins2 gene exhibits PNDM associated with pancreatic β cell apoptosis, we sequenced the human insulin gene in PNDM subjects with unidentified mutations. We discovered 7 heterozygous mutations in 10 unrelated probands. In 8 of these patients, insulin secretion was detectable at diabetes onset, but rapidly declined over time. When these mutant proinsulins were expressed in HEK293 cells, we observed defects in insulin protein folding and secretion. In these experiments, expression of the mutant proinsulins was also associated with increased Grp78 protein expression and XBP1 mRNA splicing, 2 markers of endoplasmic reticulum stress, and with increased apoptosis. Similarly transfected INS-1E insulinoma cells had diminished viability compared with those expressing WT proinsulin. In conclusion, we find that mutations in the insulin gene that promote proinsulin misfolding may cause PNDM. Citation Information: J Clin Invest. 2008;118(6):2157-2168. https://doi.org/10.1172/JCI34438. Paroxysmal dyskinesias are episodic movement disorders that can be inherited or are sporadic in nature. The pathophysiology underlying these disorders remains largely unknown but may involve disrupted ion homeostasis due to defects in cell-surface channels or nutrient transporters. In this study, we describe a family with paroxysmal exertion-induced dyskinesia (PED) over 3 generations. Their PED was accompanied by epilepsy, mild developmental delay, reduced CSF glucose levels, hemolytic anemia with echinocytosis, and altered erythrocyte ion concentrations. Using a candidate gene approach, we identified a causative deletion of 4 highly conserved amino acids (Q282_S285del) in the pore region of the glucose transporter 1 (GLUT1). Functional studies in Xenopus oocytes and human erythrocytes revealed that this mutation decreased glucose transport and caused a cation leak that alters intracellular concentrations of sodium, potassium, and calcium. We screened 4 additional families, in which PED is combined with epilepsy, developmental delay, or migraine, but not with hemolysis or echinocytosis, and identified 2 additional GLUT1 mutations (A275T, G314S) that decreased glucose transport but did not affect cation permeability. Combining these data with brain imaging studies, we propose that the dyskinesias result from an exertion-induced energy deficit that may cause episodic dysfunction of the basal ganglia, and that the hemolysis with echinocytosis may result from alterations in intracellular electrolytes caused by a cation leak through mutant GLUT1. Citation Information: J Clin Invest. 2008;118(6):2169-2179. https://doi.org/10.1172/JCI34385. Citation Information: J Clin Invest. 2008;118(6):2180-2189. https://doi.org/10.1172/JCI33637. Hypertension is a multigenic disorder in which abnormal counterregulation between dopamine and Ang II plays a role. Recent studies suggest that this counterregulation results, at least in part, from regulation of the expression of both the antihypertensive dopamine 5 receptor (D5R) and the prohypertensive Ang II type 1 receptor (AT1R). In this report, we investigated the in vivo and in vitro interaction between these GPCRs. Disruption of the gene encoding D5R in mice increased both blood pressure and AT1R protein expression, and the increase in blood pressure was reversed by AT1R blockade. Activation of D5R increased the degradation of glycosylated AT1R in proteasomes in HEK cells and human renal proximal tubule cells heterologously and endogenously expressing human AT1R and D5R. Confocal microscopy, Förster/fluorescence resonance energy transfer microscopy, and fluorescence lifetime imaging microscopy revealed that activation of D5R initiated ubiquitination of the glycosylated AT1R at the plasma membrane. The regulated degradation of AT1R via a ubiquitin/proteasome pathway by activation of D5R provides what we believe to be a novel mechanism whereby blood pressure can be regulated by the interaction of 2 counterregulatory GPCRs. Our results therefore suggest that treatments for hypertension might be optimized by designing compounds that can target the AT1R and the D5R. Citation Information: J Clin Invest. 2008;118(6):2190-2199. https://doi.org/10.1172/JCI33585. Autophagy is the principal cellular pathway for degradation of long-lived proteins and organelles and regulates cell fate in response to stress. Recently, autophagy has been implicated in neurodegeneration, but whether it is detrimental or protective remains unclear. Here we report that beclin 1, a protein with a key role in autophagy, was decreased in affected brain regions of patients with Alzheimer disease (AD) early in the disease process. Heterozygous deletion of beclin 1 (Becn1) in mice decreased neuronal autophagy and resulted in neurodegeneration and disruption of lysosomes. In transgenic mice that express human amyloid precursor protein (APP), a model for AD, genetic reduction of Becn1 expression increased intraneuronal amyloid β (Aβ) accumulation, extracellular Aβ deposition, and neurodegeneration and caused microglial changes and profound neuronal ultrastructural abnormalities. Administration of a lentiviral vector expressing beclin 1 reduced both intracellular and extracellular amyloid pathology in APP transgenic mice. We conclude that beclin 1 deficiency disrupts neuronal autophagy, modulates APP metabolism, and promotes neurodegeneration in mice and that increasing beclin 1 levels may have therapeutic potential in AD. Citation Information: J Clin Invest. 2008;118(6):2200-2208. https://doi.org/10.1172/JCI34725. AKT1-dependent molecular pathways control diverse aspects of cellular development and adaptation, including interactions with neuronal dopaminergic signaling. If AKT1 has an impact on dopaminergic signaling, then genetic variation in AKT1 would be associated with brain phenotypes related to cortical dopaminergic function. Here, we provide evidence that a coding variation in AKT1 that affects protein expression in human B lymphoblasts influenced several brain measures related to dopaminergic function. Cognitive performance linked to frontostriatal circuitry, prefrontal physiology during executive function, and frontostriatal gray-matter volume on MRI were altered in subjects with the AKT1 variation. Moreover, on neuroimaging measures with a main effect of the AKT1 genotype, there was significant epistasis with a functional polymorphism (Val158Met) in catechol-O-methyltransferase [COMT], a gene that indexes cortical synaptic dopamine. This genetic interaction was consistent with the putative role of AKT1 in dopaminergic signaling. Supportive of an earlier tentative association of AKT1 with schizophrenia, we also found that this AKT1 variant was associated with risk for schizophrenia. These data implicate AKT1 in modulating human prefrontal-striatal structure and function and suggest that the mechanism of this effect may be coupled to dopaminergic signaling and relevant to the expression of psychosis. Citation Information: J Clin Invest. 2008;118(6):2209-2218. https://doi.org/10.1172/JCI32849. Clinical and experimental evidence indicates that intestinal inflammatory conditions can be exacerbated by behavioral conditions such as depression. The recent demonstration of a tonic counterinflammatory influence mediated by the vagus nerve in experimental colitis provides a potential link between behavior and gut inflammation. Here we show that experimental conditions that induced depressive-like behaviors in mice increased susceptibility to intestinal inflammation by interfering with the tonic vagal inhibition of proinflammatory macrophages and that tricyclic antidepressants restored vagal function and reduced intestinal inflammation. These results show that reserpine-induced monoamine depletion and maternal separation, 2 models for depression, produced a vulnerability to colitis by a mechanism involving parasympathetic transmission and the presence of gut macrophages. The tricyclic antidepressant desmethylimipramine protected against this vulnerability by a vagal-dependent mechanism. 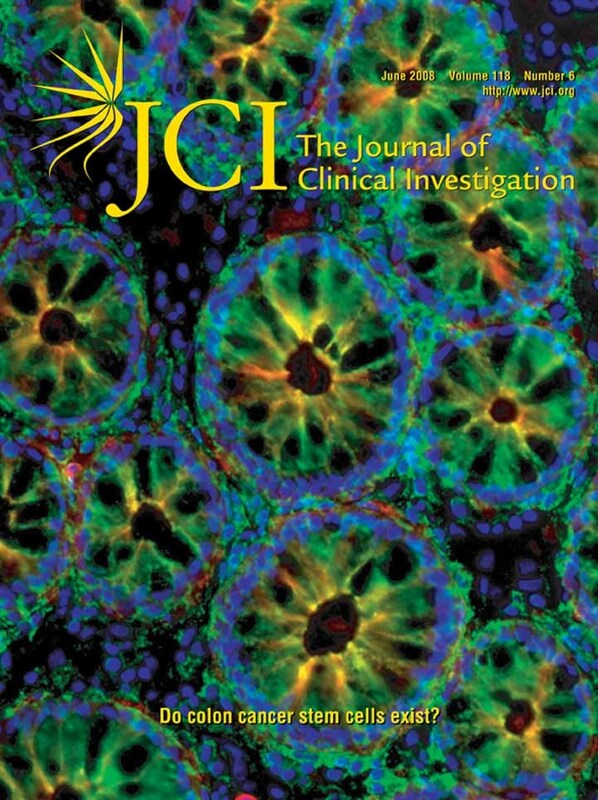 Together these results illustrate the critical role of the vagus in both the vulnerability to inflammation induced by depressive-like conditions and the protection afforded by tricyclic antidepressants and rationalize a clinical evaluation of both parasympathomimetics and tricyclic antidepressants in treatment of inflammatory bowel disease. Citation Information: J Clin Invest. 2008;118(6):2219-2229. https://doi.org/10.1172/JCI34057. Phenotypic overlap of type 3 long QT syndrome (LQT3) with Brugada syndrome (BrS) is observed in some carriers of mutations in the Na channel SCN5A. While this overlap is important for patient management, the clinical features, prevalence, and mechanisms underlying such overlap have not been fully elucidated. To investigate the basis for this overlap, we genotyped a cohort of 44 LQT3 families of multiple ethnicities from 7 referral centers and found a high prevalence of the E1784K mutation in SCN5A. Of 41 E1784K carriers, 93% had LQT3, 22% had BrS, and 39% had sinus node dysfunction. Heterologously expressed E1784K channels showed a 15.0-mV negative shift in the voltage dependence of Na channel inactivation and a 7.5-fold increase in flecainide affinity for resting-state channels, properties also seen with other LQT3 mutations associated with a mixed clinical phenotype. Furthermore, these properties were absent in Na channels harboring the T1304M mutation, which is associated with LQT3 without a mixed clinical phenotype. These results suggest that a negative shift of steady-state Na channel inactivation and enhanced tonic block by class IC drugs represent common biophysical mechanisms underlying the phenotypic overlap of LQT3 and BrS and further indicate that class IC drugs should be avoided in patients with Na channels displaying these behaviors. Citation Information: J Clin Invest. 2008;118(6):2230-2245. https://doi.org/10.1172/JCI35346. The Ca2+ release channel ryanodine receptor 2 (RyR2) is required for excitation-contraction coupling in the heart and is also present in the brain. Mutations in RyR2 have been linked to exercise-induced sudden cardiac death (catecholaminergic polymorphic ventricular tachycardia [CPVT]). CPVT-associated RyR2 mutations result in “leaky” RyR2 channels due to the decreased binding of the calstabin2 (FKBP12.6) subunit, which stabilizes the closed state of the channel. We found that mice heterozygous for the R2474S mutation in Ryr2 (Ryr2-R2474S mice) exhibited spontaneous generalized tonic-clonic seizures (which occurred in the absence of cardiac arrhythmias), exercise-induced ventricular arrhythmias, and sudden cardiac death. Treatment with a novel RyR2-specific compound (S107) that enhances the binding of calstabin2 to the mutant Ryr2-R2474S channel inhibited the channel leak and prevented cardiac arrhythmias and raised the seizure threshold. Thus, CPVT-associated mutant leaky Ryr2-R2474S channels in the brain can cause seizures in mice, independent of cardiac arrhythmias. Based on these data, we propose that CPVT is a combined neurocardiac disorder in which leaky RyR2 channels in the brain cause epilepsy, and the same leaky channels in the heart cause exercise-induced sudden cardiac death. Citation Information: J Clin Invest. 2008;118(6):2246-2259. https://doi.org/10.1172/JCI33578. Long QT syndrome (LQTS) is a heritable disease associated with ECG QT interval prolongation, ventricular tachycardia, and sudden cardiac death in young patients. Among genotyped individuals, mutations in genes encoding repolarizing K+ channels (LQT1:KCNQ1; LQT2:KCNH2) are present in approximately 90% of affected individuals. Expression of pore mutants of the human genes KCNQ1 (KvLQT1-Y315S) and KCNH2 (HERG-G628S) in the rabbit heart produced transgenic rabbits with a long QT phenotype. Prolongations of QT intervals and action potential durations were due to the elimination of IKs and IKr currents in cardiomyocytes. LQT2 rabbits showed a high incidence of spontaneous sudden cardiac death (>50% at 1 year) due to polymorphic ventricular tachycardia. Optical mapping revealed increased spatial dispersion of repolarization underlying the arrhythmias. Both transgenes caused downregulation of the remaining complementary IKr and IKs without affecting the steady state levels of the native polypeptides. Thus, the elimination of 1 repolarizing current was associated with downregulation of the reciprocal repolarizing current rather than with the compensatory upregulation observed previously in LQTS mouse models. This suggests that mutant KvLQT1 and HERG interacted with the reciprocal wild-type α subunits of rabbit ERG and KvLQT1, respectively. These results have implications for understanding the nature and heterogeneity of cardiac arrhythmias and sudden cardiac death. Citation Information: J Clin Invest. 2008;118(6):2260-2268. https://doi.org/10.1172/JCI33891. Brugada syndrome is a genetic disease associated with sudden cardiac death that is characterized by ventricular fibrillation and right precordial ST segment elevation on ECG. Loss-of-function mutations in SCN5A, which encodes the predominant cardiac sodium channel α subunit NaV1.5, can cause Brugada syndrome and cardiac conduction disease. However, SCN5A mutations are not detected in the majority of patients with these syndromes, suggesting that other genes can cause or modify presentation of these disorders. Here, we investigated SCN1B, which encodes the function-modifying sodium channel β1 subunit, in 282 probands with Brugada syndrome and in 44 patients with conduction disease, none of whom had SCN5A mutations. We identified 3 mutations segregating with arrhythmia in 3 kindreds. Two of these mutations were located in a newly described alternately processed transcript, β1B. Both the canonical and alternately processed transcripts were expressed in the human heart and were expressed to a greater degree in Purkinje fibers than in heart muscle, consistent with the clinical presentation of conduction disease. Sodium current was lower when NaV1.5 was coexpressed with mutant β1 or β1B subunits than when it was coexpressed with WT subunits. These findings implicate SCN1B as a disease gene for human arrhythmia susceptibility. Citation Information: J Clin Invest. 2008;118(6):2269-2280. https://doi.org/10.1172/JCI34610. Intestinal macrophages play a central role in regulation of immune responses against commensal bacteria. In general, intestinal macrophages lack the expression of innate-immune receptor CD14 and do not produce proinflammatory cytokines against commensal bacteria. In this study, we identified what we believe to be a unique macrophage subset in human intestine. This subset expressed both macrophage (CD14, CD33, CD68) and DC markers (CD205, CD209) and produced larger amounts of proinflammatory cytokines, such as IL-23, TNF-α, and IL-6, than typical intestinal resident macrophages (CD14–CD33+ macrophages). In patients with Crohn disease (CD), the number of these CD14+ macrophages were significantly increased compared with normal control subjects. In addition to increased numbers of cells, these cells also produced larger amounts of IL-23 and TNF-α compared with those in normal controls or patients with ulcerative colitis. In addition, the CD14+ macrophages contributed to IFN-γ production rather than IL-17 production by lamina propria mononuclear cells (LPMCs) dependent on IL-23 and TNF-α. Furthermore, the IFN-γ produced by LPMCs triggered further abnormal macrophage differentiation with an IL-23–hyperproducing phenotype. Collectively, these data suggest that this IL-23/IFN-γ–positive feedback loop induced by abnormal intestinal macrophages contributes to the pathogenesis of chronic intestinal inflammation in patients with CD. Citation Information: J Clin Invest. 2008;118(6):2281-2290. https://doi.org/10.1172/JCI32561. Niemann-Pick C1 (NPC1) is a key participant in cellular cholesterol trafficking. Loss of NPC1 function leads to defective suppression of SREBP-dependent gene expression and failure to appropriately activate liver X receptor–mediated (LXR-mediated) pathways, ultimately resulting in intracellular cholesterol accumulation. To determine whether NPC1 contributes to regulation of macrophage sterol homeostasis in vivo, we examined the effect of NPC1 deletion in BM-derived cells on atherosclerotic lesion development in the Ldlr–/– mouse model of atherosclerosis. High-fat diet–fed chimeric Npc1–/– mice reconstituted with Ldlr–/–Npc1–/– macrophages exhibited accelerated atherosclerosis despite lower serum cholesterol compared with mice reconstituted with wild-type macrophages. The discordance between the low serum lipoprotein levels and the presence of aortic atherosclerosis suggested that intrinsic alterations in macrophage sterol metabolism in the chimeric Npc1–/– mice played a greater role in atherosclerotic lesion formation than did serum lipoprotein levels. Macrophages from chimeric Npc1–/– mice showed decreased synthesis of 27-hydroxycholesterol (27-HC), an endogenous LXR ligand; decreased expression of LXR-regulated cholesterol transporters; and impaired cholesterol efflux. Lower 27-HC levels were associated with elevated cholesterol oxidation products in macrophages and plasma of chimeric Npc1–/– mice and with increased oxidative stress. Our results demonstrate that NPC1 serves an atheroprotective role in mice through regulation of LXR-dependent cholesterol efflux and mitigation of cholesterol-induced oxidative stress in macrophages. Citation Information: J Clin Invest. 2008;118(6):2291-2300. https://doi.org/10.1172/JCI34508. Citation Information: J Clin Invest. 2008;118(6):2301-2315. https://doi.org/10.1172/JCI33071. Invariant NKT (iNKT) cells are innate-like lymphocytes that recognize glycolipid antigens in the context of the MHC class I–like antigen-presenting molecule CD1d. In vivo activation of mouse iNKT cells with the glycolipid α-galactosylceramide (α-GalCer) results in the acquisition of a hyporesponsive (anergic) phenotype by these cells. Because iNKT cells can become activated in the context of infectious agents, here we evaluated whether iNKT cell activation by microorganisms can influence subsequent responses of these cells to glycolipid antigen stimulation. We found that mouse iNKT cells activated in vivo by multiple bacterial microorganisms, or by bacterial LPS or flagellin, became unresponsive to subsequent activation with α-GalCer. This hyporesponsive phenotype of iNKT cells required IL-12 expression and was associated with changes in the surface phenotype of these cells, reduced severity of concanavalin A–induced hepatitis, and alterations in the therapeutic activities of α-GalCer. These findings may have important implications for the development of iNKT cell–based therapies. Citation Information: J Clin Invest. 2008;118(6):2316-2324. https://doi.org/10.1172/JCI33655. Intrauterine growth retardation (IUGR) has been linked to the onset of diseases in adulthood, including type 2 diabetes, and has been proposed to result from altered gene regulation patterns due to epigenetic modifications of developmental genes. To determine whether epigenetic modifications may play a role in the development of adult diabetes following IUGR, we used a rodent model of IUGR that expresses lower levels of Pdx1, a pancreatic and duodenal homeobox 1 transcription factor critical for β cell function and development, which develops diabetes in adulthood. We found that expression of Pdx1 was permanently reduced in IUGR β cells and underwent epigenetic modifications throughout development. The fetal IUGR state was characterized by loss of USF-1 binding at the proximal promoter of Pdx1, recruitment of the histone deacetylase 1 (HDAC1) and the corepressor Sin3A, and deacetylation of histones H3 and H4. Following birth, histone 3 lysine 4 (H3K4) was demethylated and histone 3 lysine 9 (H3K9) was methylated. During the neonatal period, these epigenetic changes and the reduction in Pdx1 expression could be reversed by HDAC inhibition. After the onset of diabetes in adulthood, the CpG island in the proximal promoter was methylated, resulting in permanent silencing of the Pdx1 locus. These results provide insight into the development of type 2 diabetes following IUGR and we believe they are the first to describe the ontogeny of chromatin remodeling in vivo from the fetus to the onset of disease in adulthood. Citation Information: J Clin Invest. 2008;118(6):2325-2336. https://doi.org/10.1172/JCI34324. Chronic Helicobacter pylori infection is recognized as a cause of gastric cancer. H. pylori adhesion to gastric cells is mediated by bacterial adhesins such as sialic acid–binding adhesin (SabA), which binds the carbohydrate structure sialyl–Lewis x. Sialyl–Lewis x expression in the gastric epithelium is induced during persistent H. pylori infection, suggesting that H. pylori modulates host cell glycosylation patterns for enhanced adhesion. Here, we evaluate changes in the glycosylation-related gene expression profile of a human gastric carcinoma cell line following H. pylori infection. We observed that H. pylori significantly altered expression of 168 of the 1,031 human genes tested by microarray, and the extent of these alterations was associated with the pathogenicity of the H. pylori strain. A highly pathogenic strain altered expression of several genes involved in glycan biosynthesis, in particular that encoding β3 GlcNAc T5 (β3GnT5), a GlcNAc transferase essential for the biosynthesis of Lewis antigens. β3GnT5 induction was specific to infection with highly pathogenic strains of H. pylori carrying a cluster of genes known as the cag pathogenicity island, and was dependent on CagA and CagE. Further, β3GnT5 overexpression in human gastric carcinoma cell lines led to increased sialyl–Lewis x expression and H. pylori adhesion. This study identifies what we believe to be a novel mechanism by which H. pylori modulates the biosynthesis of the SabA ligand in gastric cells, thereby strengthening the epithelial attachment necessary to achieve successful colonization. Citation Information: J Clin Invest. 2008;118(6):2337-2346. https://doi.org/10.1172/JCI33361. Retinal and choroidal vascular diseases, with their associated abnormalities in vascular permeability, account for the majority of patients with vision loss in industrialized nations. VEGF is upregulated in ischemic retinopathies such as diabetes and is known to dramatically alter vascular permeability in a number of nonocular tissues via Src kinase–regulated signaling pathways. VEGF antagonists are currently in clinical use for treating the new blood vessels and retinal edema associated with neovascular eye diseases, but such therapies require repeated intraocular injections. We have found that vascular leakage following intravitreal administration of VEGF in mice was abolished by systemic or topical delivery of what we believe is a novel VEGFR2/Src kinase inhibitor; this was confirmed in rabbits. The relevance of Src inhibition to VEGF-associated alterations in vascular permeability was further substantiated by genetic studies in which VEGF injection or laser-induced vascular permeability failed to augment retinal vascular permeability in Src–/– and Yes–/– mice (Src and Yes are ubiquitously expressed Src kinase family members; Src–/– and Yes–/– mice lacking expression of these kinases show no vascular leak in response to VEGF). These findings establish a role for Src kinase in VEGF-mediated retinal vascular permeability and establish a potentially safe and painless topically applied therapeutic option for treating vision loss due to neovascular-associated retinal edema. Citation Information: J Clin Invest. 2008;118(6):2347-2364. https://doi.org/10.1172/JCI32914. Excessive production of triglyceride-rich VLDL is attributable to hypertriglyceridemia. VLDL production is facilitated by microsomal triglyceride transfer protein (MTP) in a rate-limiting step that is regulated by insulin. To characterize the underlying mechanism, we studied hepatic MTP regulation by forkhead box O1 (FoxO1), a transcription factor that plays a key role in hepatic insulin signaling. In HepG2 cells, MTP expression was induced by FoxO1 and inhibited by exposure to insulin. This effect correlated with the ability of FoxO1 to bind and stimulate MTP promoter activity. Deletion or mutation of the FoxO1 target site within the MTP promoter disabled FoxO1 binding and resulted in abolition of insulin-dependent regulation of MTP expression. We generated mice that expressed a constitutively active FoxO1 transgene and found that increased FoxO1 activity was associated with enhanced MTP expression, augmented VLDL production, and elevated plasma triglyceride levels. In contrast, RNAi-mediated silencing of hepatic FoxO1 was associated with reduced MTP and VLDL production in adult mice. Furthermore, we found that hepatic FoxO1 abundance and MTP production were increased in mice with abnormal triglyceride metabolism. These data suggest that FoxO1 mediates insulin regulation of MTP production and that augmented MTP levels may be a causative factor for VLDL overproduction and hypertriglyceridemia in diabetes. Citation Information: J Clin Invest. 2008;118(6):2365-2365. https://doi.org/10.1172/JCI35382C1. Citation Information: J Clin Invest. 2008;118(6):2366-2366. https://doi.org/10.1172/JCI33680E1.